Every child has a story. For 2.7 million children in the U.S., that story may be filled with the abandonment, loneliness, and shame that come from having a mom or dad in prison. For many, it may also include following their parents down the same destructive road to incarceration. Angel Tree®, a program of Prison Fellowship, reaches out to the children of prisoners and their families with the love of Christ. This unique program gives us an opportunity to share God's love by helping to meet the physical, emotional, and spiritual needs of the families of prisoners. 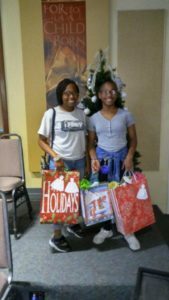 Valley Park has been involved in this program for several years and now have youth, who were Angel Tree recipients, attending our church. To God Be the Glory. Find out more at the Angel Tree website. Angel Tree at Valley Park Church is seeking a new coordinator for the coming holiday season. Contact the Deacon of Missions, Jai Belcher, for more information. When you commit to buying a gift for a child, we will include the child's information and a suggested gift type based on what the incarcerated parent picked from our gift guide. The cost of Angel Tree Christmas is minimal: $15-$25 per child.